From alligators to winding country lanes and fried zucchini, this picture book is an alphabetized list of Southern delights. Breezy rhymes recall an appreciation for good food, laid-back evenings, and the gentle dispositions the region is known for. Alison Davis Lyne is a freelance illustrator who lives and works on a small farm in south-central Kentucky. She has done spot illustrations, magazine covers, greeting cards, traditional portraits, portraits in the style of medieval icons and also paints for the fine-art market. Her love of historical illustration comes from wanting to see history as a child. NIKOLE BROOKS BETHEA is an environmental engineer and children's writer whose stories have been published in magazines such as JAKES and Living the Country Life. 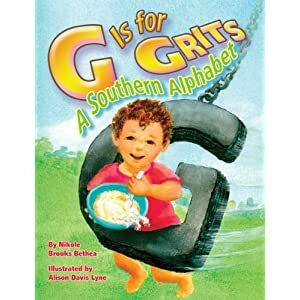 Nikole Brooks Bethea has certainly captured the essence of the south in this wonderful rhyming alphabet book. If you've vacationed or lived in the south, she will assist you in recalling all the uniqueness of this part of the United States.I believe this alphabet book would be a welcomed addition to a family's library. Adults will certainly enjoy reading it as much as children. Alison Davis Lyne's illustrations will bring a smile to your face. She has included details in each drawing which you and your child will love.